Gold Coast Party Pontoons are proud to offer their high grade vessels for hire on the Gold Coast Broadwater. Renting one of our BBQ / Party Pontoons with a group of friends or family will be one of those awesome experiences that stays with you for years to come. 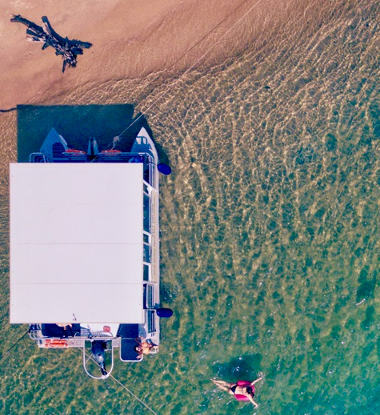 Our hire boats are unlike any of the competing Gold Coast Broadwater Hire Boats. They are much wider than most, and have plenty of walk around space even when fully loaded. They also have a number of comfort options not offered by our competition such as insulated hard roofs and drop down clear curtains. These options make our boats comfortable year round in varying and less than perfect weather conditions. If it's a bit windy, no issue, or a few showers, it's seriously ok. Please feel free to inspect prior to making a booking so you can be very sure of exactly what we have here. A huge bonus with our boats are the flushing marine toilets in private cubicals that double up as changing rooms. The Southern Stainless Marine BBQ's are first class as are the Fusion Sound Systems that add that something special to your day. The day rate starts from only $400. Contact us by phone for mid-week discounts outside peak holiday periods. Our boats are licenced for 12 people…including infants and children….and offer Supreme VALUE !!!!!! If you have a larger group, book both boats on the same day for up to 24 people. We take pride in presenting our boats super clean and in immaculate condition for every booking. 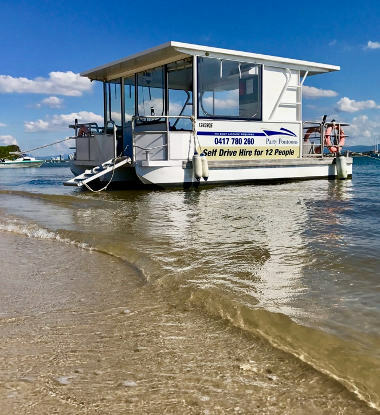 They are the best self drive BBQ boats on the Gold Coast. Take the whole family on your next fishing adventure. Must be the best and most comfortable way to fish the Broadwater in a group environment with penty of space for up to 12 people. Book Online from this website or call Craig on 0417780260 to make a booking with a 50% deposit. 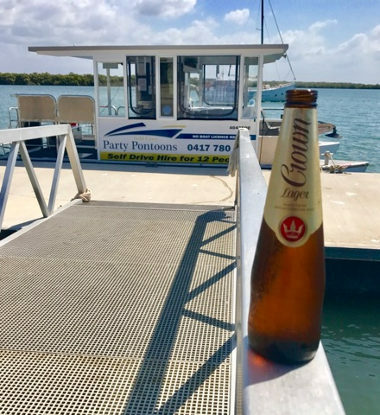 At Gold Coast Party Pontoons we pride ourselves on providing the most up to date vessels with more comfort and features than any other hire boats on the Gold Coast Broadwater.